SOCIALISM is the tag line of a bizarre new campaign against President Obama. 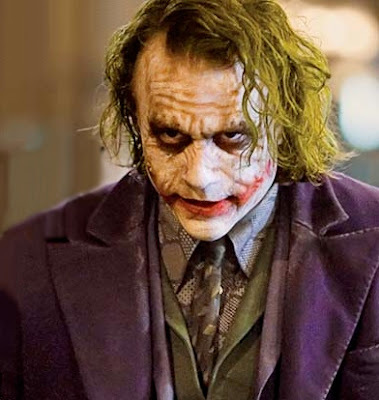 The word "Socialism" appears across an image portraying President Obama as Heath Ledger’s Joker in last year’s The Dark Knight. The Obama/Joker mash-ups have appeared on posters in Los Angeles, have gone viral on the Internet, and are available as t-shirts, mugs, and other political swag. It seems that some elements of America’s fringe Right have become embarrassingly Freudian. This is a clear cut case of projection. The Right is the Joker, not President Obama. Heath Ledger’s edgy, dark portrayal of the Joker was remarkable and disturbing precisely because it was rooted in irresistible chaos, not in tight control. If Obama’s critics are trying to claim he is a big-government loving, bureaucracy building, state-control planning mastermind then they could not have chosen a worse image than Ledger’s Joker. Joker’s evil is banal, random, gleeful and almost effortless. "Do I really look like a guy with a plan?" he asks. If the current political moment were mapped onto The Dark Knight script, it would be the right wing fringe of the GOP cast as the chaos-inducing Joker. Conservative tactics of social divisiveness feel distinctly Joker-like. Elected Republicans and conservative talk show personalities like Rush Limbaugh and Glenn Beck used the Sotomayor hearings and President Obama’s response to the Dr. Henry Louis Gates’ arrest to claim reverse racism, stoke racial anxiety, and suggest that some citizens are more worthy than others. "Each of you has a remote… to blow up the other boat. At midnight, I blow you all up. If, however, one of you presses the button, I’ll let that boat live. So, who’s it going to be: Harvey Dent’s most wanted scumbag collection, or the sweet and innocent civilians? You choose… oh, and you might want to decide quickly, because the people on the other boat might not be so noble." By encouraging Americans to nurture fears of racial and ethnic competition, the Right similarly asks us to blow up one another. They ask citizens to see themselves as more worthy than their neighbor and to destroy others for the sake of self-preservation. The Birther movement of the right wing is distinctly Joker-like in its sheer madness. By repeating their baseless claims, the Birther movement has managed to convince a sizeable portion of Southern, white Americans that President Obama may not have been born in the United States. As the bizarre strategy makes inroads into Americans’ consciousness one can almost see some Birther leaders clapping their hands with the child-like mania of Ledger’s Joker. Nothing has been more reminiscent of Ledger’s Joker than the current strategy of massive disruption at health care reform town hall meetings. The Joker blew up a hospital. The GOP is hoping to explode the effort for health care reform. Our nation faces a crisis in health care. The massive economic downturn and rising unemployment make the limitations of employer provided health insurance clearer than ever. There is legitimate and reasonable disagreement on how we should address this problem. As legislators return home for the August break, town hall meetings are one forum for airing these disagreements and discussing alternatives. Rather than organize Republican citizens to engage in thoughtful debate about an important political issue, GOP elected officials are supporting tactics of disruption and disturbance promoted by the insurance lobby. Their goal is to shut down conversation, confuse voters, and rattle members of Congress. To quote the Joker, "Introduce a little anarchy. Upset the established order, and everything becomes chaos." The Dark Knight metaphor is completed by Blue Dog Democrats. Like the film’s young politico Harvey Dent, they are turned by the Joker’s chaos tactics into two-faced madmen wiling to leave the nation’s future to chance. Here the comic book ends. Unlike the Joker, the Right has goals beyond simple destruction. The GOP wants to win back Congressional seats and retake the White House. Rather than offer substantive alternatives, they are willing to flirt with the destructive forces of reckless chaos. Americans cannot simply hope that a super hero is waiting to respond to the nation’s distress signal. We will have to save ourselves. We can and must embrace the messy work of democracy and disagreement without descending into the destruction of meaningless chaos.